Southeastern Esthetics Institute is accredited by the Commission of the Council on Occupational Education. ​We are proud of this accomplishment and our team at Southeastern Esthetics Institute, for displaying a level of excellence that meets national standards. We are EXCITED to announce EYELASH EXTENSION CERTIFICATION is now ADDED to our Esthetics Program - to extend incredible VALUE to our Esthetics Licensure Course! We are adding EYELASH EXTENSIONS Certifications through Borboleta Beauty as additional training WITHIN our existing Esthetics Licensure Course, as of October 2018! For our existing Esthetics Students, there are PERKS for you too! ENJOY! We look forward to giving you the TOOLS you need to succeed, always! The HydraFacial machine is NOW apart of our Student Clinic Floor! We are thrilled to bring consistent MODERN technology & equipment to our learning experience for students, to maintain the level of excellence we have designed for our award-winning graduates. In today’s modern & competitive environment, with ever-changing advancements in client needs, it is important for esthetic practitioners to demonstrate they can compete - and understand the knowledge level necessary in our present market. Esthetics is a booming industry that requires detailed knowledge to care for the skin on a results-oriented level. Our goal at Southeastern Esthetics Institute is to prepare you for a modern esthetics career not found at other schools in the southeast. It is our passion to change the skincare industry & mold Estheticians into top-of-the-line employees & business entrepreneurs, in order to assist consumers in achieving maximum results with their advanced skin rejuvenation goals! 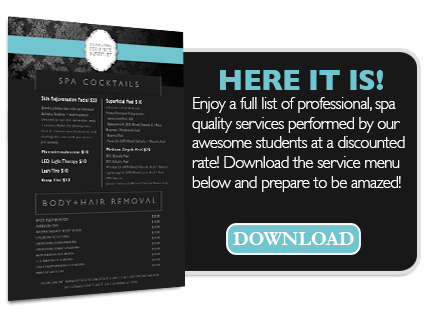 Enjoy a full list of professional spa services performed by our awesome students in our luxury teaching spa for less than you might pay elsewhere. NEW 2019 Student clinic menu is available now! download & print here! to produce top quality, Licensed Estheticians with exceptional knowledge of the skin from a scientific and clinical level - in order to obtain gainful employment and make a difference in the lives of their clients.